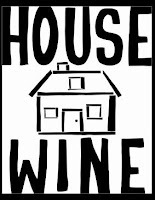 The March Virtual Tasting will be Magnificent Wine Co.'s House Wine 2006. The tasting will take place on Thursday March 26th. House Wine is an interesting blend of 54% Cabernet, 30% Merlot, 11% Syrah, 3% Malbec, and 2% Cab Franc. The wine receives wide distribution and can be found in many grocery stores for the recession friendly price of about ten dollars. The Magnificent Wine Company is a venture of Charles Smith of K Vintners and Charles Smith Winery. With Smith's iconic black and white label, this wine has been a rocket ship for the winery that many in Washington have tried to emulate. As usual, I will be opening the bottle about 7pm. This time around I will be posting running notes as I taste the wine and encourage others to do the same. While wine, like revenge, is best served cold (62-65 degrees for red wine), it is also best served with friends so I encourage you to pull some friends together for the tasting.